Razorlight are an English indie rock band formed in 2002. They are primarily known in the U.K., having topped the charts with the 2006 single "America" and its parent self-titled album, their second. 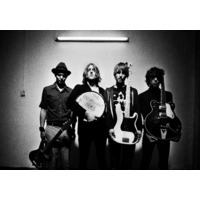 The band consists of lead singer and rhythm guitarist Johnny Borrell, drummer David 'Skully' Sullivan Kaplan, bass player Freddie Stitz and lead guitarist Gus Robertson.